Robert A. Heinlein is celebrated as one of the true masters of the science fiction genre, and this is the first of his novels to be published as a The Folio Society edition. Winning a Hugo award in 1960, Starship Troopers is one of the acknowledged masterpieces of the science fiction genre. Earth is caught in the midst of a deadly conflict with the implacable ‘Arachnids’, a swarm of insect-like aliens intent on wiping out all human life. Fresh recruit Juan ‘Johnny’ Rico signs up impulsively, keen to prove himself in the upper echelons of the Navy. Instead he finds himself assigned to the Mobile Infantry, the frontline where all that stands between life and an alien death is a sophisticated armoured suit. Serving in the US Navy for five years, Robert A. Heinlein brought the lived experience of his service to this, his most famous work. Written partly in reaction to the US policy of ceasing nuclear testing in the late 1950s, Starship Troopers remains a controversial novel, with its central argument that violent conflict is an inevitable and necessary part of human civilisation. For this, the first illustrated edition, celebrated science fiction and fantasy illustrator Stephen Hickman created seven illustrations, with two double page spreads. Hugo award winner and known throughout the SFF community for his work inspired by writers such as J. R. R. Tolkien, Larry Niven and Anne McCaffrey, Hickman brings fantastical space opera to each full-colour page, conjuring vast spaceships, unsettling chitinous legs and dreamy plumes of nuclear flame. In his perceptive introduction for this edition, Joe Haldeman, author of The Forever War, talks about the influence Starship Troopers had on his own work, and how the fallout of the Vietnam War changed the speculative fiction of the 60s and 70s. 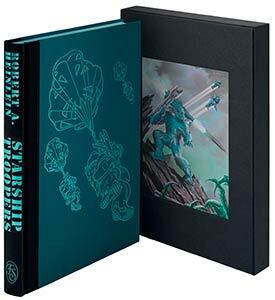 Starship Troopers by Robert A. Heinlein, illustrated by Stephen Hickman and with an introduction by Joe Haldeman, is available exclusively from The Folio Society.